Samsung has unveiled its highly awaited Galaxy Note 8, which will be available for preorder starting tomorrow, August 24. The device goes on sale in both the UK and the US on September 15. As for the Note 8 price, the phablet is going to cost £869 in the UK and but the starting price for the United States hasn’t been released by any carrier yet. the price has now been announced by several carriers and electronics retailers in the United States, as well. The Samsung Galaxy Note 8 comes in four colors: Midnight Black, Orchid Gray, Maple Gold and Deep Sea Blue. However, in the United States, the device will only be available in black and gray. It is unclear where exactly will the Gold and Blue options be available or if Samsung will introduce them at a later date. While carriers are yet to announce their deals, Best Buy has already released one appetizing promotion. The electronics retailer is offering $150 savings on top of the freebies that are being offered by Samsung with Galaxy Note 8 preorders. If you preorder the Galaxy Note 8 on August 24 from Best Buy, you will be able to save $150 along with the Samsung freebies. Best Buy’s Galaxy Note 8 preorders start at 12:01am ET online and on Thursday morning in the brick and mortar Best Buy retail stores. 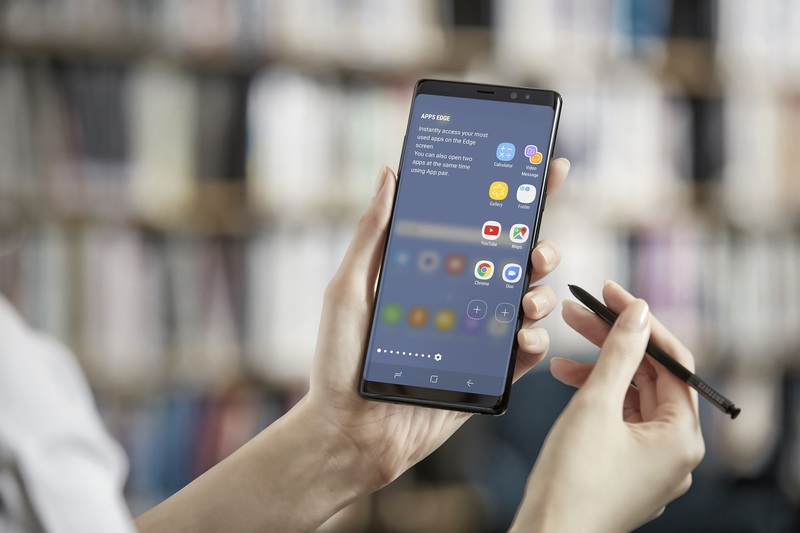 Along with that, the company is also offering 24-month financing on the unlocked Galaxy Note 8 when purchased with its My Best Buy credit card. So, there you have it. You can get your hands on this giant phone for just $930 along with freebies worth over $200, making it one sweet deal. We will update this post as more retailers and carriers share their own deals. Best Buy is also carrying preorder deals from Verizon, AT&T, and Sprint. Verizon is also taking preorders starting tomorrow in the same Midnight Black and Orchid Grey color options. The carrier has shared that the 64 GB model price will start at $40 a month for 24 months on a payment plan. You can buy the unlocked version for $960. Similar to Best Buy, Verizon is also offering something extra along with the promised Samsung freebies. The company has said that buyers will be able to receive up to 50 percent off their new device with an eligible trade-in. Additionally, you can also get $100 off the Samsung Gear S3 with a two-year activation. You can preorder the Galaxy Note 8 in the two color options available to US customers starting 9:01pm PT today, August 23. T-Mobile is also offering the Galaxy Note 8 starting from $930. The company is offering the device on $210 down payment and $30 a month on EIP and $0 down with $39 a month for JUMP! On Demand customers. AT&T will offer the Note 8 for $950. On the Next Plan, you can get the smartphone for $31.67 a month for 30 months. You can also avail the BOGO deal if you purchase a Note 8 on AT&T Next with a DirecTV subscription. Sprint is starting preorders on August 24, with an offer to those switching to Sprint with $0 down payment and for $20 a month for 18 months through the Sprint Flex program. Existing customers can get the Note 8 for $39.59 a month for 18 months or $33.33 a month for 24 months. Customers who switch to U.S. Cellular and preorder the device can receive a $300 promotional card. Contingent on New Equipment Instalment Contract, Total Plan or Shared Connect plan, Device Protection +, and credit approval. $100 U.S. Cellular Promotional Card will be given at point of sale. Additional $200 U.S. Cellular Promotional Card will be mailed to customer within 6-8 weeks. [Update]: US Cellular is apparently offering the prepaid model for $900. Preorders start $32.10 a month for 30 months with $0 down payment. More here. If you buy the Samsung Galaxy Note 8 from Sam’s Club by September 24, you can get the Samsung freebies (Gear 360 at $230 OR the charging bundle at $190). You will also get a $200 Sam’s Club gift card if you get the Note 8 on a Verizon, AT&T, or Sprint installment plan. Those who get the devices activated by September will also receive a waiver of the activation fee ($40). Samsung is offering some awesome trade-in deals with a few of our readers reporting saving as much as $500. For more details, visit this earlier post. Samsung UK is offering the unlocked Galaxy Note 8 for £869.00. The UK is also offering the device in only two color options of Midnight Black and Maple Gold. Vodafone is offering the Note 8 for £50 down payment and £60 a month for 16 GB of data. EE deals start at £89.99 down payment with £57.99 a month with 5 GB of data a month. O2 Galaxy Note 8 preorders are already live starting at £49.99 down payment and £66.00 a month, with 10 GB of data per month. Carphone Warehouse is offering unlocked the Note 8 for £869. You can also avail other deals based on the carrier you select. Sky Mobile is offering the Note 8 at just £38 a month without any down payment with a Swap24 plan. The offer includes 500 MB of data and free unlimited calls and texts for Sky TV customers. Will you buy the Galaxy Note 8?